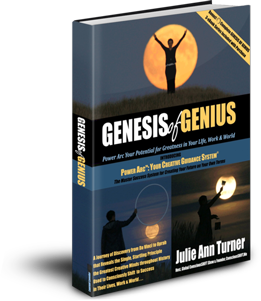 The way to tap into our own inner personal genius, which is another word for our inspiration, is to let go of anything that stands between that and ourselves. 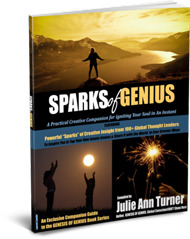 Each one of us inhabits a space of where our creative spark called the Genius resides. For me this inspiration comes when I give me myself total permission to let go, to relax, to allow it to take over me without my own personal judgments and conditions. It is a little bit like free floating in the ocean. It takes a lot of trust to know that you will end up somewhere. In writing for example, I have had to teach myself to suspend my critical voice, my judgments and my mentalizing, to allow what is needed to come out. Often the artist in me opened up at unexpected moments and then my job was to capture it. It is not something you can put on your to-do list. It is more something that you put in your to-be list. When you open yourself up a lot of stuff can come out before you get to the pearl of your genius. Trusting that process for me has been the greatest gift. It is the ability to stand still in the midst of what it sometimes feels like a hurricane of thoughts, emotions, and free-floating insecurity. In the middle of the stillness I discovered the eye of the hurricane. It is a still place and has tremendous joy. I feel it is our job, our responsibility to allow it to take over because it knows best. That is where the genius resides in each one of us and it expresses itself in myriads of unique ways. 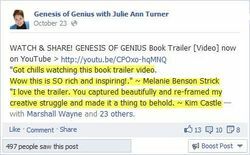 If you compare yourself to anyone else’s genius or creative process, you have done yourself a great disservice. Be true to your creative spark, however small, however big, and however it wants to manifest. Trust it, claim it, it is yours for the taking and partaking. 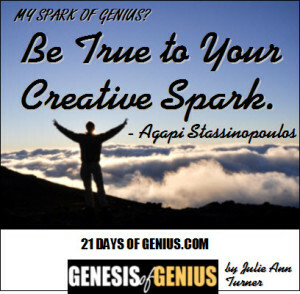 Greek born, Agapi Stassinopoulos is a best-selling author and speaker who inspires audiences around the world. Her most recent book, Unbinding the Heart, has been featured on Oprah.com, HuffPost Live, CBS’s The Talk, and The Martha Stewart Show, among others. She uplifts and warms the hearts of audiences from the American Heart Association, Women’s Conferences, Entrepreneurial Organizations, the Girl Scouts of America, TED, and many more. She was trained as an actress at the prestigious Royal Academy of Dramatic Arts in London and then she received her Masters in Psychology from the University of Santa Monica. 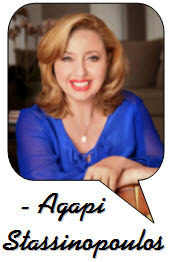 Agapi has written two books on the Greek Archetypes, Gods and Goddesses in Love, and Conversations with the Goddesses, which were turned into PBS shows. She developed a curriculum on Heartfelt Leadership for the Wharton Business School that shares the tools to bring conscious leadership into today’s workplace. In her book, Unbinding the Heart, Agapi brings her innate gift to connect with her readers by sharing the stories of wisdom from her childhood; how she, and her sister, Ariana Huffington, were raised by an amazing mother who instilled in Agapi deep values and the journey of how she found her voice. Her passion is to help others unlock their gifts to fully express themselves and help her fellow human beings live a fulfilling life.